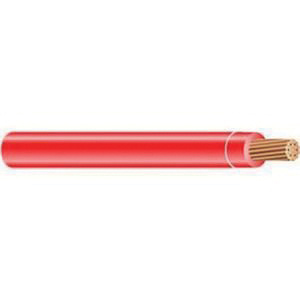 4-AWG Annealed copper THHN building wire has 0.006-Inch red nylon jacket to withstand harsh environmental conditions. The 0.04-Inch thick PVC insulation resists electrical leakage and offers protection against environmental threats. This wire has current rating of 95-Amps and voltage rating of 600-Volts. It withstands dry temperature rating of 90 deg C and wet temperature rating of 75 deg C. This 0.322-Inch OD wire of length 1000-ft comes in a reel. It is suitable for services, feeders and branch-circuits in commercial as well as industrial applications. Building wire is UL listed 83/758/1063/1581, CSA C22.2 No. 75/NOM-ANCE 90 deg C certified, RoHS/REACH compliant and meets Federal specification A-A-59544, NEMA WC-70, ASTM B3/B8/B787, National Electrical Code, NFPA 70 standards.